Cannabis being legal allows me to meet people with years of experience and years of hiding it in order to remain respected in business and in life. After legalization, people get a true look at what cannabis users are like. I never really comprehended chronic pain until I myself had to live with it. So naturally, when I met Kimmi I couldn’t help but feel we were destined to be friends. It was after several exchanges on Facebook that I was given the privilege of finally meeting this sweet inspiring lady. Kimmi is happily retired and worked as a nurse most of her life so she’s no stranger to medicine. It was a pretty day considering it was December when I found myself in a coffee house in Tulsa with Kimmi and a new friend the both of us had met just that day. For someone boasting with personality she sure didn’t have much to store it. She was smaller than me and I stand 5’2” and I’m probably a size 4 depending on the store. Along with pain comes the stress. Along with pain comes exhaustion, irritability and most importantly a desire to wake up one day and just feel normal. Unlike other pain sufferers, this isn’t a victim story. This is a story of a courageous woman who fought hard against the dying of the light. I can say this just from the brief few months I’ve known her she smiles even when her eyes don’t. She laughs harder at herself than she would anyone and she’s always grateful for whatever advice or information we throw her way. This was an observation easily made by those who know her. There’s rarely a serious moment when we talk and even talking about her health seemed difficult. I suppose there are too many wonderful things to discuss instead of difficulties. There is a level of strength or weakness when talking about struggles. There are two things you gain from telling a sad story: You either gain pity or you get respect, you’re either a victim or you’re a survivor. With strong survivors like Kimmi being a victim and not obtaining respect is unheard of. When I see tears from a survivor it’s rarely tears of sadness, but more so tears of exhaustion. It’s tears of holding everything inside. 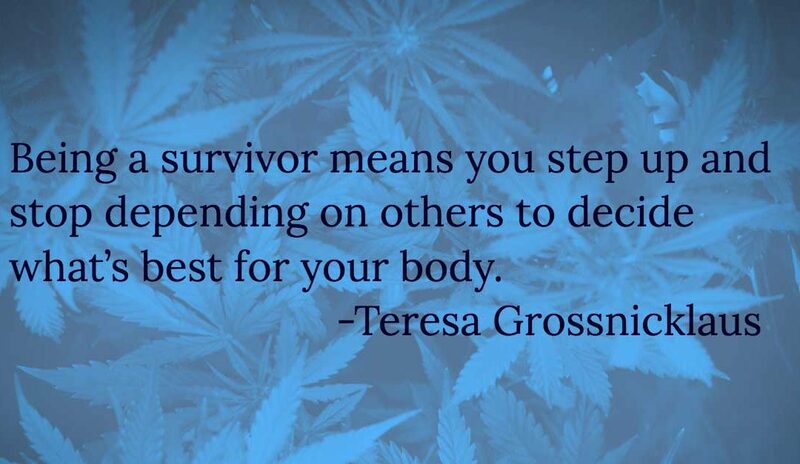 Being a survivor means you step up and stop depending on others to decide what’s best for your body. It’s clinging to those flashes of light when every part of you just wants to sleep through it all. Fibromyalgia is a disorder that causes widespread musculoskeletal pain. Research has suggested that fibromyalgia causes pain sensation to become amplified and largely affecting how the brain processes pain signals. One of the most difficult things to tackle is pain and there’s a huge fluctuation of pain sufferers looking to cannabis to alleviate the symptoms that come with pain. This is what Kimmi and many other fibromyalgia patients suffer through daily. There are pharmaceutical pain medications, but like most of us have learned it doesn’t take long before the dose must be increased, or it stops working altogether. One of the things most pain sufferers do is avoid medication until necessary or continually changing them to avoid increasing the dose. It is an entire life adjustment figuring out what you can take at what time, what you can drive on and what will it alter your thinking. It’s a balancing act to maintain sanity but really attempt to not become your pain. As Kimmi and I discussed, with time comes the effects of aging and those effects don’t all need a pill. Most doctors are merely alleviating the effects of time then medicating the effects of the medication. A vicious cycle to which nobody is getting well. I can’t say cannabis can tackle pain in its entirety, but like a lot of us who have been researching and consuming, finding the right combination without the help of lab testing has proven to be difficult. Once mandatory testing is in place having the right potency combined with the right combination of terpenes will work, but with the Oklahoma cannabis industry still in its infancy, we must wait to truly have access to what we need to create cannabis-based medicine that works. Pain is something that I have been working to tackle and I had reservations about being so open about cannabis not helping my chronic pain because I realize there are people who do feel relief. I didn’t want my experience to be the standard as I’ve seen the wonders it has done for my liver. There are different types of pain and despite what I have read I know what I feel. It was my desire when I was first injured to avoid narcotics at all costs. One reason I can give for why cannabis works for some and not others could be because what most people suffer from is their body’s own ability to fight pain and how it has been replaced by narcotics. I think of patients like Kimmi and how much more enjoyable waking up every morning would be without hurting. What we learn through our experiences is nothing short of solid research. We can take our pain and let it take us down or team up as I have with my sweet friend.